The following displays which date and time continuing students may register for courses for the Autumn 2019 term. Registration Groups: Students registered with Disability Services, Four Bear Program participants, NCAA student athletes, Davidson Honors College students, and students enrolled to receive VA education benefits are attached to a group for registration. If you belong to more than one group, or your class standing precedes your group, you may register on the earliest day. If you do not belong to specific Registration Group, you shall register based on class standing. Students may register during and after their scheduled day/time. 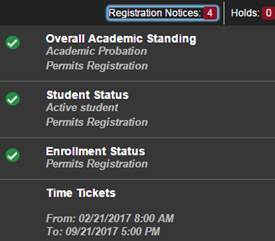 View your “time ticket,” or assigned course registration start time, in CyberBear. • Log in to CyberBear, and click Student Services. • Change the term in the top left corner to the term you wish to register. • Registration Notices appear at the top right. Click to view your time ticket. In the example above, the student could begin registration for the selected term on 2/21/2017 at 8am. The course registration timetable is intended for returning and continuing students at the University of Montana – Missoula and Missoula College, as well as new graduate students. Are you a new undergraduate at UM or Missoula College? Welcome! Your course registration is integrated with the variety of freshman and transfer orientation programs offered through Undergraduate Admissions.